Resist colour fading with natural botanical-derived ingredients with the Aveda Color Conserve Travel Set; a travel-sized haircare trio formulated specially for colour-treated tresses that maintains colour vibrancy and promotes shine. 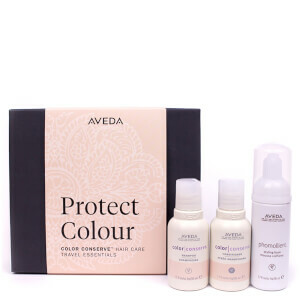 Combining a shampoo and conditioner duo from the brand’s Color Conserve™ range with a volumising styling foam, the travel set ensures bright, colour-rich hair with a halo of blinding luminosity. Presented in a sleek gift box. Extend the vibrancy of your colour-treated hair naturally. Colour Conserve™ is a gentle plant infused shampoo, with 100% organic aroma, formulated to resist fading. A nourishing, colour-protecting conditioner designed for colour-treated hair that seals your hair cuticles to lock in colour and shine, while its 100% organic aroma brings nature closer. It detangles your hair while adding brilliant shine for healthy locks that boast incredible gloss. 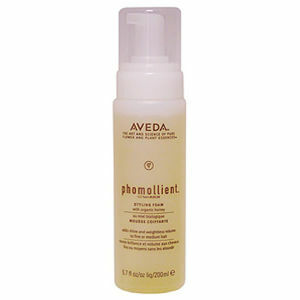 Add body, volume and shine to fine hair with Phomollient™. It activates curl and controls frizz in textured and permed hair, while giving light to medium hold. Shampoo: Massage onto wet hair. Lather and rinse. Follow with Color Conserve™ Conditioner. Conditioner: After using colour Conserve™ Shampoo, work colour Conserve™ Conditioner throughout your hair. Rinse and style. Styling Foam: Use to build body in fine hair. Spray 1-2 pumps into hand. Rub hands together to distribute evenly and apply to damp hair; distribute near the roots for added lift. Use a round brush and blow-dry to create volume. Do not shake bottle. Shampoo: Aqueous (Water\Aqua\Eau) Extracts\Extraits Aqueux: Camellia Sinensis (Green Tea) Leaf Extract, Citrus Aurantium Amara (Bitter Orange) Peel Extract, Astragalus Membranaceus (Milk Vetch) Root Extract, Schizandra Chinensis Fruit Extract, Pinus Tabulaeformis (Pine) Bark Extract, Vitis Vinifera (Grape) Seed Extract, Sedum Rosea Root Extract, Rehmannia Chinensis Root Extract, Ammonium Lauryl Sulfate, Disodium Laureth Sulfosuccinate, Lauramidopropyl Betaine, Cinnamidopropyltrimonium Chloride, Babassuamidopropyl Betaine, Dimethicone PEG - 7 Cocoate, Guar Hydroxypropyltrimonium Chloride, Quaternium-80, Amyl Salicylate, Isoamyl Cinnamate, Lycopene, Lecithin, Tetrahexyldecyl Ascorbate, Tocopherol, Sucrose Palmitate, Stearamidopropyl Dimethylamine, Glycol Stearate, Glycol Distearate, Polyglyceryl-10 Oleate, Polyquaternium-7, Cistus Ladaniferus Oil, Fragrance (Parfum)*, Linalool, Geraniol, Citronellol, Limonene, Glycerin, Citric Acid, Sodium Gluconate, Methylisothiazolinone, Methylchloroisothiazolinone <ILN41108>. Conditioner: Aqueous (Water\Aqua\Eau) Extracts\Extraits Aqueux: Camellia Sinensis (Green Tea) Leaf Extract, Vitis Vinifera (Grape) Seed Extract, Sedum Rosea Root Extract, Pinus Tabulaeformis (Pine) Bark Extract, Astragalus Membranaceus (Milk Vetch) Root Extract, Citrus Aurantium Amara (Bitter Orange) Peel Extract, Rehmannia Chinensis Root Extract, Schizandra Chinensis Fruit Extract, Cetyl Alcohol, Stearalkonium Chloride, Glyceryl Stearate, Distearyldimonium Chloride, Cinnamidopropyltrimonium Chloride, Ricinus Communis (Castor) Seed Oil, Simmondsia Chinensis (Jojoba) Seed Oil, Cistus Ladaniferus Oil, Hydrolyzed Wheat Protein PG-Propyl Silanetriol, Lycopene, Sucrose Palmitate, Panthenol, Lecithin, Tocopherol, Amyl Salicylate, Isoamyl Cinnamate, Fragrance (Parfum)*, Linalool, Limonene, Citronellol, Guar Hydroxypropyltrimonium Chloride, Cetrimonium Chloride, Phenyl Trimethicone, PEG-100 Stearate, Stearamidopropyl Dimethylamine, Dimethiconol, Cyclopentasiloxane, Polyquaternium-7, Polyglyceryl-10 Oleate, Glycerin, Citric Acid, Sodium Gluconate, Phenoxyethanol <ILN29661> Linalool, Farnesol, Benzyl Benzoate, Amyl Cinnamal, Benzyl Salicylate, Citronellol, Eugenol, Limonene, Citric Acid, Sodium Gluconate, Potassium Sorbate, Phenoxyethanol <ILN37994>. Styling Foam: Water, Lappa (Burdock) Root Extract, Althaea Officinalis (Marshmallow) Root Extract, Polysorbate 20, Glycerin, Polyquaternium-11, Polyquaternium-10, Honey\Mel\Miel, Oryzanol, Tocopherol, Glycine Soja (Soybean) Oil, Fragrance (Parfum), Geraniol, Linalool, Farnesol, Benzyl Benzoate, Amyl Cinnamal, Benzyl Salicylate, Citronellol, Eugenol, Limonene, Citric Acid, Sodium Gluconate, Potassium Sorbate, Phenoxyethanol <ILN37994>.